The infrastructure of the Grängesberg iron ore mine is excellent. Globally, very few comparable iron ore projects can show a similar transport solution potential. Adjacent to the mine is a main line railway with direct connection the Port of Oxelösund at the Baltic Sea coast. This railway is used daily for heavy freight and passenger service. The extensive marshalling yard, where loaded trains will be assembled for dispatch to the port, is still intact and connected to the railway line, although currently little used. The Port of Oxelösund is very well suited for iron ore products, can service Panamax size vessels, and is ice-free in wintertime. On closure in 1990, all the mine’s facilities were transferred into ownership of the local municipality. Offices and workshops are in generally excellent state of repair and to a large extent available for use when the mine is re-opened. Considerable underground infrastructure exists, although now waterfilled. Several shafts on the footwall side of the open pit are available, three of them with headframes still intact. An internal ramp system is continuous throughout the mine below the 410mL, connecting all extraction levels. A decision was made in 1966 to sink new shafts, feeding a new treatment plant, at the southern extremity of the orebody. Four Alimak raises were developed from the 515mL to surface and one excavated to a final, elliptical size of some 8m x 4m. However in 1972, all shaft development within the project was stopped, due to a decision that the Central Shaft was not at risk. All underground equipment was subsequently removed, and the shafts were capped. The sinter plant and associated power facility were however completed and are still in place, now being used for other industrial purposes. 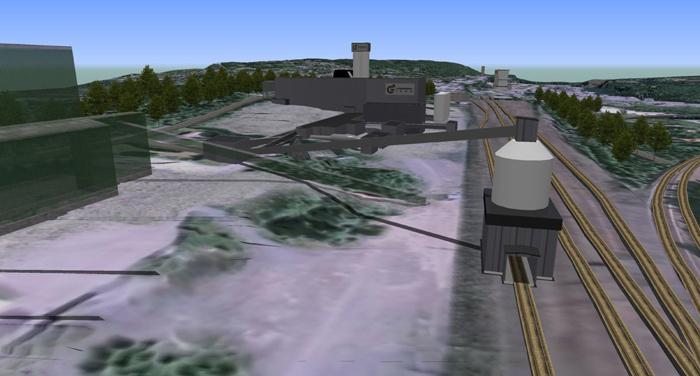 Marshalling yard (simplified view) with loading station at Grängesberg, according to Pre-Feasibility Study.